I know I said I wouldn't.... but I've decided to put it out there as an option. What is the point of "Points"? THe more you post, the more points you get. But what can you do with them? Introducing... Anonymatrix Pets. When you post a new topic, you are awarded 3 points. If you reply to a topic, you receive one. However, you get 4 points for posting a new topic in the "Welcome" section if you are a newcomer, 4 if you post in the "Psychiatrist's Chair" and "Strokes", and 2 for replying to a topic in the "Psychiatrist's Chair". If these pets are activated, you can "buy" a pet of your choice with these points, and your pet will have 3 "heath bars". "Hunger", "Hygiene" and "Fun". You can fill these up by using the points you earn. You can also donate points to your friends, and can be awarded extra points if you do good deeds for Anonymatrix. However, do wrong, and your points may be lesser than you thought. So the pets thing is just an idea. You can choose from a list of cute critters, name it anything you want, and look after it to the best of your abilities. Anyone interested? Please vote AND comment. Remember, just by commenting here, that's another point to your list! 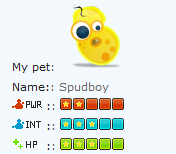 IF this pets thing comes into play, I will need a moderator or two to help me with them. IF and WHEN this comes into play (not before), PM me your mod application (Name, why you want to help, what can you do to help, how have you earned the "mod" title, any additional info). I like pets. But where would they go? In the rank I suppose? Also... Could there be less bars, cause I don't want to be worrying about this little guy. They would go on your profile, and if you want, below your picture on all your posts. Originally there were 5 bars, so I can't really cut it down anymore. I don't think they can die. This is basically an example. If there's power and health and stuff will we be able to like fight each others pets?! O_O THAT WOULD BE AMAZING!!! I don't think they can battle, but I can look into it. And sorry Angel, but just one. How many points would they be? I'm yet to figure that out. First, I'm just trying to sort out whether people like the idea or not... looks like you do! Then I'll hire a mod to help me, then I'll discuss the prices, and then make them. I like them being under our avatars. I don't think I would enjoy going back to my profile multiple times, just to check up on him. PLEASE PM ME YOUR MOD APPLICATIONS!!!!!!!!!!!!!! If you're already a mod of something else, you're about to get a PM from me. 2) I remove everyone's custom ranks and re-assign them once they've paid up. How do you pay? That's what the shop is for. You can post it there, OR PM me saying "I want to buy my pet one hunger bar" and I give you that bar and remove a couple of points. How much do these things cost? Again, that's what the shop is for. I'll tell you there, and different things cost a different number of points. REMEMBER: This isn't real money. Just pretend. The more you post, the more points you earn. Anonymatrix is a FREE website, and even if I one day host it myself and I have to personally pay for it out of my own pocket, it will STILL BE FREE! It's will ALWAYS be free! (If I decide to host the site myself, then I will start accepting donations, but not until then).